It was great. Explained all options for my care and was very honest about my situation. *Please note that The Portland Clinic maintains a 24-hour cancellation policy. If you need to cancel your appointment within 24 hours of the start time, please contact the practice as soon as possible. 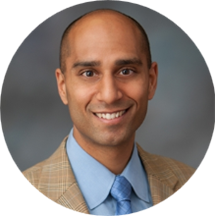 Jay Shah is an engaged and attentive cardiologist caring for the Portland and Beaverton, OR communities. Dr. Shah attended the University of Missouri, Kansas City, where he earned his degree in medicine. He completed his residency in internal medicine at Massachusetts General Hospital and then went on to do his fellowship in cardiovascular diseases at Washington University, St. Louis. Dr. Shah is a part of The Portland Clinic. He is board certified in internal medicine and cardiovascular diseases by the American Board of Internal Medicine. Outside of his practice, Dr. Shah enjoys bicycling, cooking, baking, and spending time with my family and friends. Dr. Shah is devoted to ensuring the longevity of his patients’ health and developing long-lasting relationships with them. He takes his time to understand symptoms and give correct diagnoses to ensure the continued health of all his patients. Top doctor in Portland Monthly’s 2014, 2015 and 2016 “Top Docs and Nurses” feature. As always a very positive visit. Great care with Dr. Jay Shah and the nurses are very profetional and caring. Excellent service provided with kindness, care, respect, and professionalism.